Using HubSpot can help your company (or your clients) build a content marketing foundation. When done right, it can help you grow your audience, capture more leads and convert those leads into sales. But some simple mistakes can derail those efforts. We teamed up with the research team at Databox and asked 38 marketers which content marketing mistakes they’ve seen HubSpot users make most often. While the most common struggle companies have is turning leads into opportunities, customers struggle with every part of the inbound marketing and sales process. The #1 mistake I see businesses make is writing content that doesn’t directly or indirectly generate sales for the business. For example, writing articles that target keywords with the highest searches regardless of the relevance to the business. Traditional marketing has often been so focused on the point of sale, or as we inbound folk like to call it ‘decision stage.’ When business owners are starting with inbound marketing, they have trouble focusing on anything but sales-related content. “Then it begins to get fun,” says Santana. Some of JijOnline’s clients are “new to the game” and “think that just blogging and creating valuable content is enough,” says Sebastian Kopp. “The most common mistake we see HubSpot users making when it comes to content marketing is not putting any thought or time into promoting the great blog post that they just wrote. It just doesn’t work that way anymore. Interested in Becoming a HubSpot User? An effective content strategy is built on clearly defined buyer personas. Without a doubt, the #1 inbound marketing mistake Hubspot users make is not TALKING to their best (or ideal) customers when defining their content strategy. The tools will help streamline the management of these things and provide insights to steer your program, but, if you want to see real results from your inbound marketing, be prepared to work. 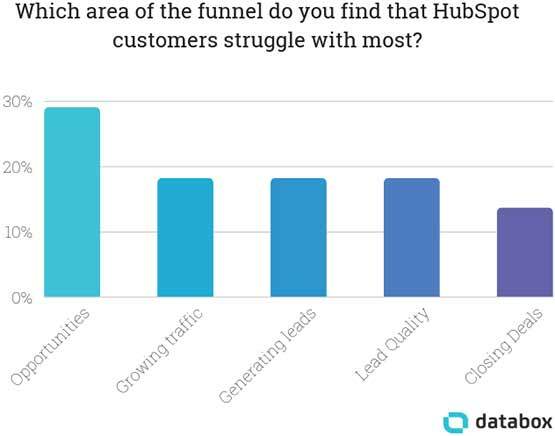 On the other end of the spectrum are HubSpot users that aren’t using HubSpot to its full potential. “The most common mistake is not taking advantage of all the tools that HubSpot offers,” says Mario Merino Fernandez from El Orfanato Ideas Sin Madre. And while most of them do use the blogging tools, they don't understand the value of placing a call to action on every article to help establish additional lead conversion points. Hello Anna’s AnnaLea Crowe adds segmentation to the list of features that don’t get used often enough. “Users often forget to do the little things when it comes to setting up their campaigns in HubSpot,” says Campaign Creators’ Jesse Schor. One of the biggest content marketing mistakes that people make—regardless of the platform they use—is publishing bad content. “The biggest mistake we see is the rapid creation of content for the sake of creating more content,” says Tim Jones from Eternal Works. “The biggest mistake and most common mistake for inbound marketers is trying to sell their product in every aspect of their business,” says Matt from Apruve. They use blogs to point to the benefits of their products which makes their content unshareable. Similarly, many companies write only for bottom-of-funnel readers, says Avidly’s Jonas Faizi. No matter which platform you use, that’s just not the way to approach content marketing. “One of the most common content marketing mistakes I see HubSpot customers make is not providing CTAs in their blog content,” says Nathan Heider from Campaign Creators. So often, I see websites only promoting decision-stage calls-to-action on their website. “[E]ven alongside awareness and consideration-stage content. Zerys has teamed up with HubSpot for this incredible offer! These professional templates were designed to build trust and maximize conversion rates. Using the right tool for your content marketing can help you reap the benefits of inbound. But it’s easy to use it incorrectly. Whether you focus too much on the tool, don’t use its features to their full extent, or just don’t have the strategy and content to run a good content operation, you’re not going to meet your marketing potential. Learn from the experiences of other marketers, fix your (and your clients’) HubSpot content marketing mistakes, and you’ll see big improvements in your content marketing. To learn more about marketing strategies to avoid and how to do content marketing right, check out our white paper, "How the Right Blog Content Strategy Can Power and Simplify All Your Online Marketing." What are some of the worst content marketing mistakes have you seen HubSpot users make? How do you go about fixing them? Share your thoughts in the comments below!